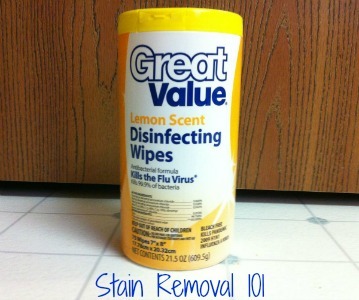 I recently needed some more cleaning wipes, and grabbed a two pack of Great Value disinfecting wipes when I went to Walmart. I confess I was a bit leery of trying any new brand after my recent debacle trying the natural disinfecting wipes from Scotch Brite and Seventh Generation that I shared with you earlier, since they both stunk up the whole house! Therefore, this time I went with something more similar to the wipes I'm already quite familiar with, those from Clorox and Lysol. However, as I looked at all the varieties on the shelves I was struck by how very expensive they all are. Then, I noticed the Great Value brand, in the lemon scent, and how much cheaper it was than the name brand products and decided, what the heck, I'll try them. I've had some great success with several other cleaning and laundry products from Walmart so I wasn't too worried to try them. Turns out I was right not to be concerned. These wipes are just like the ones from Clorox, except the lower price tag. In fact, if you placed them in the brand name's' container and didn't tell me, I don't believe I would have noticed the difference. as you close the flap at the top after each use), and they dispense easily enough from the top of the container. I personally prefer lemon scent to "fresh scent" (which is the other scent available), but that is personal preference only. I didn't think the scent was overpowering in any way, which I appreciate. We use wipes mainly in the kitchen or bathroom to wipe up spills or sticky, smelly messes, and they did their job for us. I definitely suggest if you're trying to save money, and don't have a coupon that makes the name brands less expensive, to try store brand products. Another reviewer and I both shared our Up & Up brand wipes review here (they are the store brand made by Target) and we liked them too. I'd love to hear from even more readers who've tried any brand of these wipes, sharing what they thought of them. You can share your review here, or read other reviews of other brands already shared. Join in and write your own page! It's easy to do. How? Simply click here to return to disinfecting wipes.